Apple just announced their new iphone, and just like expected it wasn’t an iphone 5 but an iphone 4’s. We where quite disappointed, kind of like with the iphone 3gs. But it holds quite some surprises so go check out the full covergae. Basically the same old iphone 4 design, so the old accessories will all fit. The internals however changed at-least a little bit, with the same A5 dual core processor as the ipad 2. But it also has a new 3D dual core graphics processor will will according to apple makes the iphone 4’s seven X fasten than the previous iphone 4. They also threw in a new Internet card with the faster HSPA+ network capability. That means you can get cellular internet speeds up to 14.4 Mbps. Obviously depending on carrier and location. Oh and excitingly (unlike the old model) the GSM version of iphone 4’s will be infact faster than the CDMa (verizon) one due to the fact that the GSM one has HSPA+ but the verizion ipone has the same old card as the iphone 4. There is also a new camera with 8 megapixels compared to the previous 5 MP on the old model. The most interesting thing is the sensor, however: It’s a CMOS backside illuminated sensor. Apple says that gets you 73% more light than the iPhone 4 sensor. Also they upgraded the lens itself to inv´cclude 5 lens elements. Wich is supposed to give f2.4, wich is extremly good for a phone camera. If im not mistaken it beats Sony’s exmor sensors which are designed for low light conditions. Also this beast will be shooting 1080p video at 30FPS and to help it has a real-time stabilization system and temporal noise reduction on its side. The battery time will basically remain unchanged. They say it will give you 8 hours talking battery life with 3G networks. If you set your phone to 2G, you will get 14 hours of talk time. 3G web browsing will give you six hours of battery life, while Wi-Fi access runs up to nine hours. Oh and guess what, they fixed the iphone 4 death grip antenna issue for good! Apple is also including Siri in the iPhone 4S, which will only run in this model (and presumably the iPad 2). The reason is the need for a faster A5 processor. It can call people, play music, send and receive text messages and emails, reading them with a natural human voice or set up events and meetings, remind you of stuff… You can also dictate in any app. But the key about Siri, according to Apple, is that it isn’t just voice recognition. It really understands natural language and follows complex commands. It’s conversational too, so it will reply back to you and you can reply back to it. Think Enterprise’s computer vs the current crop of voice recognition software. This thing actually seems smart, judging by the demos. It actually interprets what you are saying. You don’t talk to it using commands. You just talk to it like you would talk to another person. So instead of asking “tell me the weather today” you can just say “Do I need a raincoat?” and it will reply “It sure does look like rain today!” Or if you say “Wake me up tomorrow at 6am” it will automatically set up the alarm for you. Or “hey, remind me to buy milk later” and it will remind you to buy milk as you pass near a grocery store—yes, Siri is location aware. Siri also pulls information from Wikipedia and Wolfram Alpha to give you smart answers to your questions. You can even ask him for definitions, which Siri will read out loud. Apple has not disclosed if Siri would be available for developers, but I don’t see why not. It’s only logical to expect all apps to be integrated in the assistant flow, so you can ask Siri to buy you two tickets for Avengers playing around 7 on a Sunday. That’s the kind of stuff this thing seems able to do, although we would have to try it to know. Siri will only support English, French and German in this release. Apple says that they will keep expanding the services as time goes by. As for the pricing it will cost 199$ for the 16Gb model and 299$ for the 32 and 399$ for the 64GB version. As for the old iphone 4 it will get a price reduction to 99$. In the US it will be released on october 14. Internationally it will be released in this order United States, Canada, Australia, United Kingdom, France, Germany and Japan. 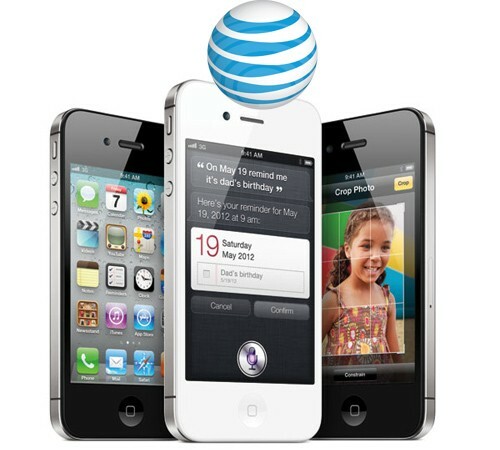 For AT&T users AT&T’s Upgrader app is now live in the App Store.